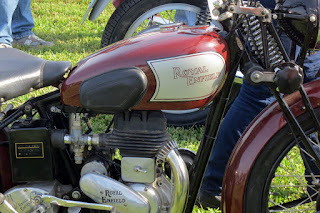 Royal Enfield Model DC is so little known that they had to make up a name for it. 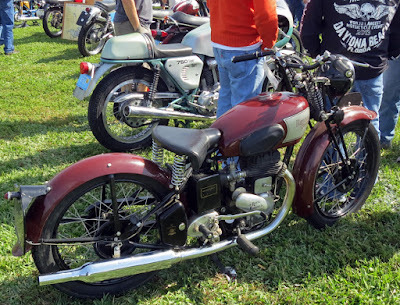 The graceful little Royal Enfield "Model DC" I spotted at the Dania Beach Vintage Motorcycle Show last Saturday is a far rarer motorcycle than I realized. Lucky for me that Graham Scarth, chairman of the Royal Enfield Owners Club UK, does know something about the Model DC and this very example in particular. He has been in contact with the owner and has tracked down additional information about the little known machine. "It is a 'bored and stroked' version of the 1939 Model D side valve 250, which, along with overhead valve Model S/SF had a separate oil tank sandwiched in between the engine and gearbox. "A number of these machines were 'conscripted' into Australian military service and are recorded in the Australian War Memorial Archives. We do not think it was ever sold on the UK market, and have no idea how many were built as the factory records have not survived. Side-valve motor looks small, but it's a 350cc. "We also do not know the official factory designation, so the DC moniker was agreed upon by our WD (War Department) machine specialist Jan Vandevelde and myself to avoid confusion with the (standard) 350 Model C with oil compartment in crankcase." Owner Bob Losik of Boynton Beach told me in an email that his little Royal Enfield appears to have been restored, perhaps in the 1990s. 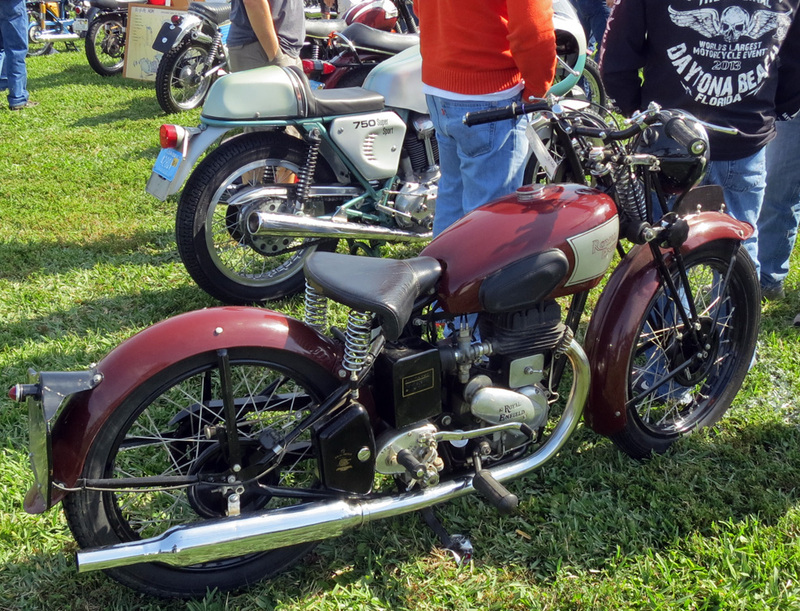 Bob has dealt with restorations enough to sense when something has been altered, and this Royal Enfield looks essentially original to him. That's particularly interesting because it suggests that his Model DC was meant to be a civilian motorcycle. Jan told Bob that he believes that the Royal Enfield Model DC was the progeny of a prototype lightweight military motorcycle Royal Enfield offered the British Army before Dunkirk. It was essentially a 250cc sized motorcycle with a 350cc motor. The Army rejected that design. But someone at the factory must have liked it because apparently some very small number of these little motorcycles were made anyway. Having seen photos of Bob's Model DC, Jan's theory is that these were meant to be civilian motorcycles, without the prototype's modifications for the military. He thinks the few DCs made by the fall of France were swept up by the war effort, but, as oddballs, they were shipped off to Australia to help with the war effort there. They became military motorcycles after all. The British Army would take vast numbers of military Royal Enfield motorcycles during the war but for the civilian Model DC, the outbreak of the war apparently brought down the curtain. After the war, with so many surplus WD motorcycles to refurbish and offer the public there was no need to bring back the little Model DC. All of which makes Bob's example rare indeed.